While the Beachbreak by the Sea may be small—it stands only four stories in a sea of high-rises—the resort is big on warmth and charm. 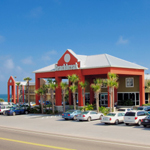 One of BY THE SEA RESORTS’ three gulf-front Panama City Beach hotels, the Beachbreak offers 97 newly-renovated rooms and an array of room types including accommodations with private gulf-front balconies and fully-equipped kitchens as well as cabana-level rooms. Because all of the rooms are affordable, you can take a break without breaking your budget! Discounts at Gulf World Marine Park located across the street, at the nearby Pier Park shopping, dining and entertainment complex and at our beachfront bar and grill next door make your stay even more affordable! Beachbreak by the Sea is graded A+ by the Better Business Bureau. The Beachbreak is an official sponsor of Panama City and Panama City Beach’s hottest special events including Spring Break, Thunder Beach, Emerald Coast Cruizin’ and several sporting events. Many Ironman Florida triathletes choose the Beachbreak. We’re saving you a front row seat on Panama City Beach at Beachbreak by the Sea!